Back in the mid-seventies, as Cedar Mill was just beginning to really grow, Chuck Richards recognized the need for an athletic club in the area. In 1977 he opened the Cornell Court Club across the street from Sunset High School, with a focus on racquetball, a sport that was just gaining popularity at that time. It was the first suburban athletic club in the state. The four-court indoor tennis building that sits right on Cornell was added in 1978. 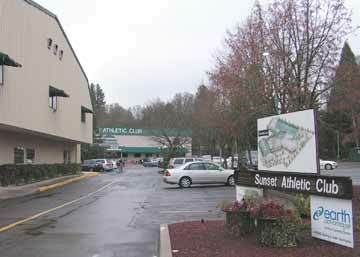 As the club and the community grew, more sports and fitness facilities were added and the club changed its name to Sunset Athletic Club in 1988. Now in the midst of a four-phase expansion, the club has something to offer nearly everyone. Richards, a lifelong athlete, won three consecutive National Pentathlon championships in the late sixties and early seventies., and was the highest scoring American at the Olympic Games in Munich in 1972. He is currently the president of the Oregon Sports Hall of Fame. His early dreams of bringing sports and fitness to the community have become a reality. It hasn’t been without difficulty, though – a major fire that started in the men’s locker room destroyed the main building in 1995. But it took only eight months to open an even better building with more facilities. Responding to the huge growth in the region, the increased interest and the wide variety of activities that people enjoy in pursuit of fun and fitness, the club embarked on an ambitious four-phase growth plan in 2001. 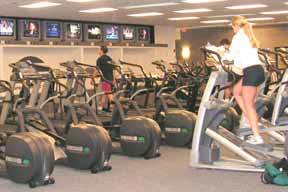 Phase I of the expansion added new exercise rooms for spinning (stationary bicycles) and cardio equipment, physical therapy space and increased parking. It opened in late October 2003. 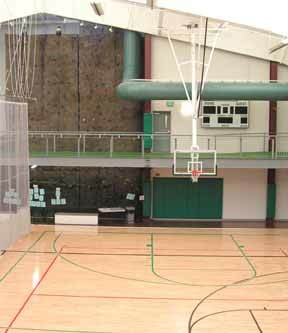 Phase II opened in the spring of 2004 and included three more indoor tennis courts, a gymnasium, and running track, a cli mbing wall and additional parking. Phase III, set to open in February 2006, provides chlorine-free indoor aquatic facilities that will include a 25-yard 81° lap pool, 86° pool for group fitness, and a 91° therapy pool. The new facility will also include a large jacuzzi with sauna and steam rooms. Outside there will be a grass sports area , two more tennis courts and a splash pad water play area. Phase IV will connect all the buildings, and create new administrative space, meeting rooms, a multimedia theatre for sports clinics and parties, and an expanded snack bar. Additional facilities to be included in this phase are two additional group fitness rooms and two championship squash and racquetball courts. Richards and the design staff wanted to ensure the expanded facility would be energy- and resource-efficient. They consulted with Portland General Electric’s Earth Advantage™ Program during the design stage. They incorporated a number of features to maximize the building’s performance including an energy efficient boiler, heat exchangers, occupancy sensors for the lights, and skylights that let in daylight with light monitors that adjust electric lighting to the amount of light coming in. 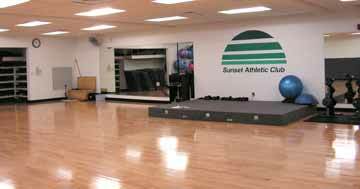 Sunset Athletic Club uses an estimated 40 percent less energy than if the owners installed standard equipment. The measures will pay for themselves in just under seven years. These features were financed with special loan and tax credit programs from Oregon’s Department of Energy. Other “green” features of the building include recycled wood in the floors, use of Metro’s recycled paint on the walls, carpets made of recycled pop bottles, and even concrete floors stained with recovered battleship rust! Prentice continues, “The climbing wall has proved to be an attraction for all ages. Even middle-school kids love it, and that’s a hard age group to reach. Families often come to climb together, and it’s very popular for parties.” The club offers many party options to members of all ages. Their membership fee structure is designed to be simple and accessible too. “We don’t play games with discounts or special sales,” Prentice explains. Information about fees and complete schedule information is available on their website, at sunsetac.com. You can reach them by phone at 503-645-3535.